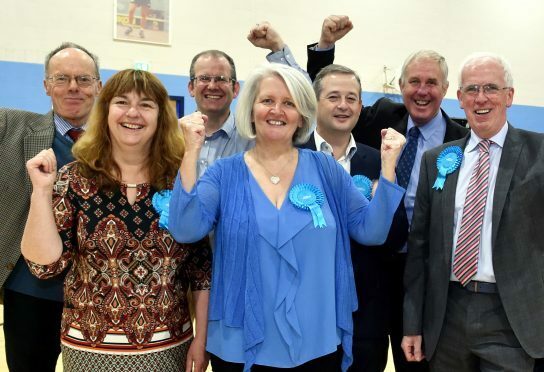 Winner of the Scottish Conservative & Unionist candidate for the 2017 Inverurie & District by-election Lesley Berry (in blue) surrounded by supporters. Picture by COLIN RENNIE October 13, 2017. Aberdeenshire Conservatives were celebrating yesterday after keeping hold of a council seat and winning the Inverurie by-election. Tory leaders hailed the “fantastic” result after the party increased its share of the vote by more than 12% – maintaining the balance of power with 23 members in the coalition administration. Lesley Berry was elected to the Inverurie and District ward, which was left vacant after Colin Clark stepped down when he was elected as MP for Gordon in June. The Scottish Conservatives took 1,672 first preference votes (48.35%), which was up from 35.95% in May’s local elections. The poll was triggered by the resignation of Mr Clark after he ousted long-term incumbent, Alex Salmond at the general election. Mr Clark said yesterday: “This is a fantastic result for the Scottish Conservatives and marks four in a row for the party in recent elections in Inverurie. A total of 3,445 votes were counted at the Garioch Sports Centre yesterday morning, representing a 30.9% ward turnout. Aberdeenshire chief executive, Jim Savege, acted as returning officer and announced Mrs Berry as the winner with 1,672 votes, with SNP candidate Elaine Mitchell receiving 1,146, Liberal Democrats’ Scott Bremner on 295, Labour’s Sarah Flavell with 276 and the Green candidate, Craig Stewart on 56. 26 votes were spoiled.